We sell ONLY what we have in physical inventory, call or text 651.795.8057 to find out what we have in inventory! We pay nearly 50% more money than your local pawn shop, jewelry store, or precious metals dealer. Get paid as much as the professional gold dealers get paid. Get paid as much as you would if you owned your own gold buying business. 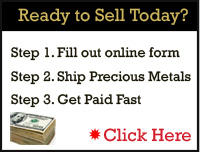 You do not have to be a precious metals dealer to get paid like one. It is easy to get paid just as much as the professional gold dealer gets paid by using M & M Gold Exchange as your only place to sell your precious metals. M & M Gold Exchange is a precious metal wholesaler that buys Gold, Silver, Platinum and Palladium. We specialize in buying large lots from pawn shops, jewelry stores and other gold buyers. We normally buy very large lots from these precious metal dealers which allows us to pay you the highest dollar amount anywhere. We will purchase one individual item or your entire collection. M & M Gold Exchange is the place to sell your items for similiar prices other gold buyers get paid after buying from consumers. M & M Gold Exchange does not use high costing retail centers to conduct our business so we typically have the ability to pay higher prices than any other precious metal dealers. Our mission is to provide you with the highest payout without the dishonest practices that most people encounter when dealing with other precious metal buyers and refiners. M & M Gold Exchange is committed to setting the standard for efficient, cost effective business practices which allow us to compete at a level that most retail outlets simply are unable to do. We simply test all your items for purity and weight and then we send your payment the same day. Please follow our easy 3-step system to sell your gold or precious metals today. How much do we pay? Use our Precious Metals Calculator to find out what your gold or precious metals are worth. How to sell your Gold for the most money? How do I know my gold is real? & What do the markings mean? How to test your gold? Click to find our free calculator and mobile app at the app store. What is my gold worth? How to get most cash for gold or silver. Where to sell gold. How to test gold. Is my gold real or fake? Step by step how to test your precious metals. 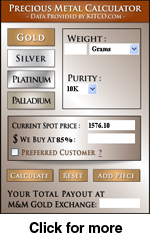 How to use our free Precious Metals Calculator for Android or Apple mobile devices?